Online reviews play an important role in the decision making process of potential customers. Reviews are trusted third party assessments of how your business performs and what kind of pre and post purchase customer service you provide. There are many websites and online communities where customers may review your business, however arguably the most important place is Google’s own review system which shows reviews and a star rating of your business whenever a customer does a Google search for you. If you’re not already familiar with Google reviews, they utilise a five star rating judge to your business. Any Google account holders are given the opportunity to write a review for your business. Based on the reviews you’ve been given, Google’s algorithm calculates an average overall star rating. The ratings serve as a visual snapshot of how your business rates to customers. Google reviews are a vital part of your digital marketing strategy. Having a good Google rating (4 stars and above) will likely increase your click through rate and enquiry rate. This star rating serves as a trust builder, reassuring potential customers to make their purchase decision. 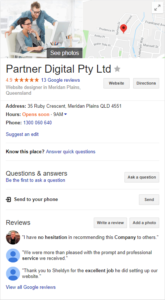 For example, if you search on Google for a web designer in Caloundra, you will be presented with Local Listings on the Google Map. Star ratings will be shown next to each business listing. I’m sure you would be more inclined to contact business with 5 stars and several reviews from happy customers, than contact a business with no stars or lots of bad reviews. In years past, businesses needed to have at least 5 reviews before a star rating would be shown. However Google has lowered this requirement so that your business will show a star rating as soon as you have any reviews. This means that if you only have one or two reviews, each review is extremely important, as they can damage or boost your online reputation. Unfortunately, as a business owner you cannot control what kind of reviews customers leave for your business, meaning every customer review has the potential to significantly impact how your business looks to others. Have a policy/program to always ask happy customers for reviews. Granted, not every customer will bother to write a review, but you only need a few requests to convert into favourable reviews for your online presence to be drastically improved. Make it easy and simple for your customers to write a review. If they have to jump through hoops to leave a review, most will not bother. Send your customers a link directly to where they can write the review. Respond to negative reviews. If you do encounter any bad reviews, don’t bury your head in the sand. Acknowledge the customer’s problem, apologise, and work to resolve the issue. Not only will that person appreciate you taking the time to address their issue, but potential customers will see that you care enough to work through problems, which can boost your company’s credibility. We’ve seen many bad reviews removed or turned into positive reviews. If you’ve had a really bad falling out with a customer, or you want to save face, get a different staff member to reply to the customer. This can be the fresh take that the customer needs to change their mind.